I’ve been thinking a bit about the unit operations (discrete, interlocking units of meaning). In particular the unit operations of cultural heritage organizations. What do libraries, archives and museums do in games, and how do they do it? I have pulled a few examples out from the game Magic the Gathering, but I would be thrilled to have readers share examples of libraries, archives and museums and librarians, archivists and curators from other games in the comments on this post. 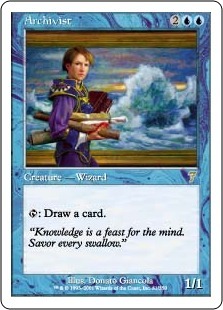 Magic the Gathering has a Curator, Archivist, and Librarian in it. 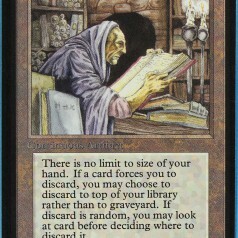 The Archivist and the Librarian have functions related to drawing cards, which in the practice of the game has the effect of making more knowledge available to the player. For those who haven’t played Magic the Gathering, the general premise of the game is that you and your opponent are wizards. You each have a “library” of spells, artifacts and land (represented by the deck of cards, I like to imagine it’s like the deed to the land or something) which they draw from to do battle against each other. In the logic of the game, the Archivist let’s you draw an extra card every turn, and the Orcish Librarian (apparently because he is an orc) is a terrible librarian who can let you look at what cards you have coming up in your deck but then removes half of them at random from the game (from the card it would appear he is eating some of your books). The Angelic curator, in contrast, has nothing to do with drawing cards. 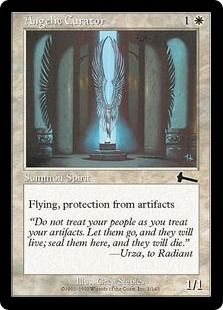 It’s is a flying spirit that is immune to the effects of artifacts. I imagine his immunity comes from it’s extensive knowledge of artifacts. 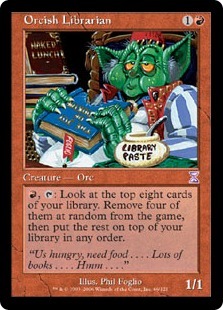 There are also 5 other cards with the word Library in their title, three other cards with the term archive in their title, and no cards with the term museum in their title. So, What are your favorite examples of libraries, archives and museums and librarians, archivists, and curators in games? Beyond that, what do you think their operations in the game say about what cultural heritage and memory organizations mean in contemporary society? Also, what do you make of these cards? What do you think they say about how we think about different kinds of cultural heritage organizations? Two years ago at the last Frontiers of New Media Symposium, Clare Woods from Duke University gave a presentation about the portrayal of libraries and museums in semi-historical games like World of Warcraft. Her one of her main critiques was that the portrayal of libraries usually just draws off of modern library aesthetics, while completely ignoring the functional aspects of these spaces, such as the production of books (noting that a medieval library would normally be full of lecterns for scribes). Videogame libraries tend to be little more than large rooms full of familiar library stacks. I think similar arguments could be made about archives and museums in games (when they are included). While the aesthetic component of museum displays is sometimes present, we rarely see any of the research or preservation aspects of these spaces included in any meaningful way. As noted on Twitter, there was printed about a year ago another Archivist card, http://gatherer.wizards.com/Handlers/Image.ashx?multiverseid=220244&type=card who lets you draw a whole bunch of cards at one go, but makes you discard your existing cards first. Looking at the card with my archives professional hat on, I can’t help wondering if this is some sort of accidental commentary about poor practices in digitization and/or digital preservation. The library building in Majesty, as far as I can tell, behaves consistently with your findings. It enhances heroes’ intelligence, lowers research costs throughout the kingdom, gives wizards something to do, and offers spells for “intelligent heroes” to learn (and some only for wizards). But, more interesting might be the library in the city of Tarant in Arcanum, which uses a paywall, and seems reminiscent of the private fee-based lending libraries that sprang up out of the industrial revolution. Some of the materials are free to use in the library, but to get the help of the librarian and access all the materials, your character must pay a subscription fee (or, because this is Arcanum, engage in criminal activity).